Experts hired by Apple and Samsung explained and justified their differing damages claims to a California jury Monday as the latest battle between the two smartphone giants moves closer to a conclusion. The two companies have been arguing in front of a jury for four days over the amount of money Samsung should pay to Apple for infringement of five of Apple's patents in 13 models of Samsung smartphones and tablets. 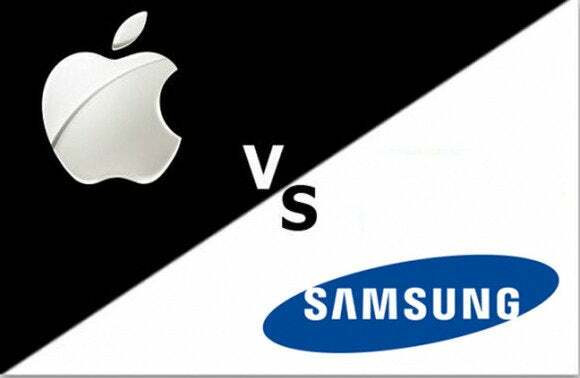 Apple wants $380 million and Samsung is arguing that $52 million is a more fair amount. The question of damages is in front of the court after Judge Lucy Koh ruled a jury miscalculated damages when it considered the matter in a case last year. That case confirmed Samsung's infringement of the patents in multiple phones and tablets, and the jury ordered Samsung should pay just over $1 billion. Judge Koh cut $450 million from the award because of the bad jury math. The current trial is re-evaluating the damages. The patent infringement ruling stands and that aspect is not being argued again. The court heard first on Monday from Samsung's damages expert, Michael Wagner, under questioning from Apple's lawyers. On Friday he told the court that he disagreed with all of the conclusions of Apple's damages expert, Julie Davis. Apple says it would have sold an additional 360,000 iPhones if Samsung hadn't used its patented technology in its phones and part of the payment it wants covers its lost profits in those lost sales. On Monday, Wagner repeated his assertion that Apple wouldn't have won additional sales. Samsung is arguing that consumers pick its phones for many reasons, chief among them the larger screens, the desire to use Android or Google services and longer battery life. But the patented features don't influence buying decisions. The Apple patents in question cover the phone's ability to automatically switch between single and multitouch gestures, the "rubber-band" effect that makes the screen bounce when coming to the limit of scrolling, and the effect of a tap on the screen to re-center the display after zooming. Whether Apple lost any sales will be one of the first questions for the jury to answer because it has a direct impact on the size of the damages award that will be made. The two experts also argued over how much money Samsung made from selling the 13 infringing products. The question on basic profits centered around how certain expenses incurred by Samsung should be attributed -- to some of the infringing phones or to the mobile phone division in general. It's probably more detail than the eight jury members ever wanted to know about the ins and outs of the mobile phone business, and it was also the last time they'd be hearing it. The two sides rested their cases just before the court took a lunch break. The court is set for closing arguments Tuesday. Each side will have 90 minutes, then, after a lunch break, the jury is scheduled to begin its deliberations. The case is 11-01846, Apple v. Samsung, at the U.S. District Court for the Northern District of California. In a separate ruling in the patent infringement case, the U.S. Court of Appeals for the Federal Circuit Monday said that Judge Koh erred when she denied Apple's request for an injunction on sales of Samsung products that were found to infringe Apple patents. She had ruled that the monetary damage was enough compensation for Apple in that case. The appellate court found that parts of her ruling were correct, but sent the case back to her to reconsider Apple's arguments that it was damaged by Samsung's patent infringement, which may warrant an injunction.